Some of England's biggest cities outside London are to be given significant extra powers and money. This is in return for promises to bring down youth unemployment and speed up regeneration and economic growth. The six "city deals" are for Newcastle, Birmingham, Bristol, Leeds, Nottingham and Sheffield, with deals for Liverpool and Manchester already agreed. Deputy Prime Minister Nick Clegg called them "groundbreaking deals... freeing cities from Whitehall control". "Everyone in these eight core cities will feel the benefits - from young people looking for jobs, to businesses looking to expand. "Over the coming months, we are transferring more and more power from Whitehall to these cities." At the moment councils running England's major cities have to lobby central government if they want extra money to invest in a major transport scheme or regeneration project. It can take years to get a decision. Under these new city deals, guaranteed funding is being provided for the city authorities to spend as they choose. But in return, the cities have had to sign up to a series of promises. Leeds is pledging to eliminate all Neets (people not working, studying or training) from the city in return for the power to run transport policy in the region. Sheffield will get extra money in return for a promise to create 4,000 apprenticeships. If this is the right thing to do for our core cities, then what about the rest of England? 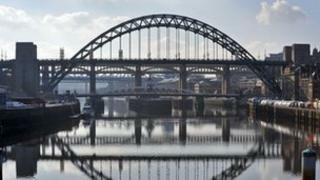 Newcastle is getting funding in exchange for a plan to regenerate areas of the city. The government is not finding new money to hand to cities, but is slicing off chunks of Whitehall departments (like transport), and allowing decisions on how the money is spent to be taken locally rather than in London. The plan is also to make it easier for cities to borrow money against the future income they might be able to generate from a project. Further ways are being explored to get the private sector more involved in financing big transport or regeneration projects. These deals are all specific to the individual cities, and the result of negotiations with ministers which began last December. At the time it was hoped that the city deals would come into being alongside a number of powerful new city mayors. But referendums on directly elected city mayors failed comprehensively in May, with all except Bristol voting "no" to the idea. Liverpool did not have a referendum, but has now got an elected mayor, after a decision by the council. The government says the city agreements were never conditional on having elected mayors. But, ministers have been pressing some cities to strengthen the way in which they are governed, before signing off on a deal. In transport, the key question is whether a city is big enough to have its own transport policy. That is partly why the likes of Leeds, Bradford, Barnsley and Harrogate are forming a new combined authority of West Yorkshire. Together those cities will be able to argue that they form a coherent area over which transport decisions can be taken. This follows the creation of the Greater Manchester combined authority, which has now also secured a city deal. With these announcements, the government is trying to breathe fresh life into its localism agenda but critics may say it is another example of ministers trying to devolve with one hand and dictate with another. There are questions about whether the sums of money on offer are significant to make much of a difference to the cities, and achieve progress towards the coalition's stated aim of "rebalancing" government and the economy away from London and the south east. Labour has welcomed the deals but is calling for the government to go much further and offer similar deals to councils in all parts of England - not just the big cities. Shadow Communities and Local Government Secretary Hilary Benn said: "If this is the right thing to do for our core cities, then what about the rest of England? "What we now need is a clear commitment that local authorities in all parts of England - including other cities, counties and districts - will be given the same opportunity to come together and take back power in the interests of the communities they represent." One expert in urban development said the rejection by many cities of elected mayors did not mean there was opposition to cities getting more economic powers. "City mayors was not a concept that was really very well talked about so people were not clear what powers would come with it," said Alexandra Jones, chief executive of the Centre for Cities. "These city deals are about specific projects, about transport funds, rebuilding city centres. So actually you will be able to see progress on the ground".